It’s raining as we pull into the cul-de-sac high above the village of Caleta Tortel, a shanty-style, coastal settlement constructed on stilts. To reach the village you have to descend endless wooden walkways and wooden steps on foot, leaving your dust-covered truck alongside all the other, dust-covered trucks at the top of the cliff. For us, this is literally the end of the road, there’s nowhere else to go. Over the past 8 days we’ve driven over 1200km of the Chilean Carretera Austral, known locally as Ruta 7, the only arterial road connecting the remote islands of the southern tip of Chile with the capital, Santiago. 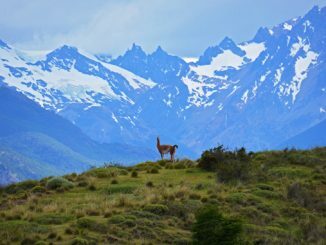 The road ends at Puerto Yungay, just outside Caleta Tortel and from there, a ferry takes you across the fjord to Rio Bravo and the final 100km of Carretera Austral to reach Villa O’Higgins on the border with Argentina. For most of our journey the road has been little more than a series of deep potholes and hard, rutted earth held together by rocks and dust. Progress has been slow; painfully, dustily slow. We walk towards a wooden archway with the word ‘Información’ printed on it. “We’re closed,” says a sullen looking girl. “We’re looking for Lodge Entre Hielos,” we say. “It’s just down there on the right,” says sullen girl, pointing to the thin wooden boardwalk on wooden stilts that trails off into the distance. She gives us directions and we head off along the boardwalk. With a population of just 507 people, less than a handful of restaurants and shops, and very few places for visitors to lay their heads, it seems astonishing to me that any one of its residents doesn’t know every doorway in the settlement. 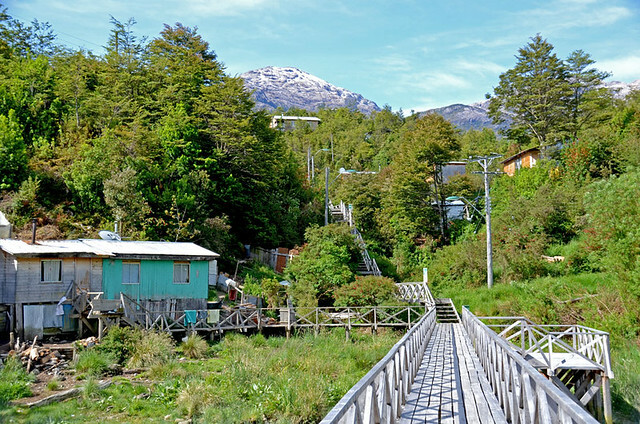 But as we descend, we pass Hielo Sur Residencia, a small pension, and I conclude it was a ‘lost in translation’ moment. We’re carrying an overnight bag, hiking boots and two rucksacks whose contents include two bottles of wine and three litres of water. Despite the dank weather, we’re beginning to sweat. We pass groups of people strung out along the steps, puffing and gasping their way up from the village, some resting, draped across the handrail while they get their breath back. I take comfort in the knowledge that we won’t have to come back up for two days and by that time, the wine and the water will no longer be a feature of our luggage. When we reach the water’s edge we turn right along the boardwalk and follow it around the bay. 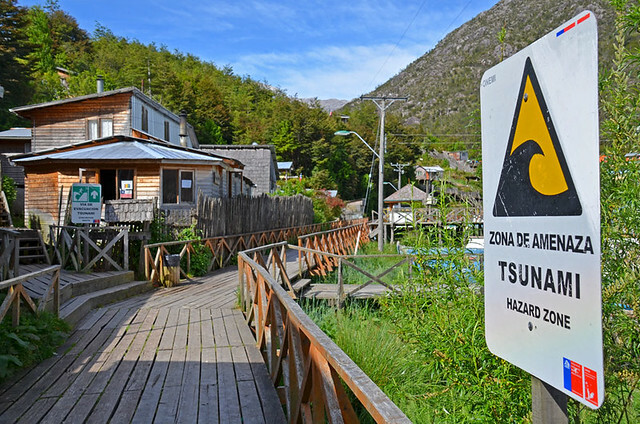 At regular intervals, Via de Evacuacion Tsunami boards denote walkways turning their backs on the water’s edge and climbing steeply into the forest. The surface of the milky turquoise water of the estuary is dancing to the tune of the rain that has now set in with purpose. Across the estuary, steep, green banks plunge to the shoreline, their tops hidden in mist. Around the bay, only the telltale spirals of wood smoke rising from chimneys betray the presence of houses, obscured by the rain forest. Just when it seems like we must have gone wrong, we see a wooden sign for Lodge Entre Hielos, another Via de Evacuacion Tsunami route, pointing up steep steps into the dense undergrowth. Slowly, painfully, we climb, reaching a flat section and brief reprieve before climbing again. By the time we arrive at the front door of the lodge, half hidden within the rain forest, high above the bay, my breathing is laboured, my face is burning and I’m cursing the wine and water. As we step inside, a blanket of warm air greets us, inviting us to take off our rucksacks and our coats, relax our shoulders, and warm our feet at the wood burning stove, a smile spreading across our faces. 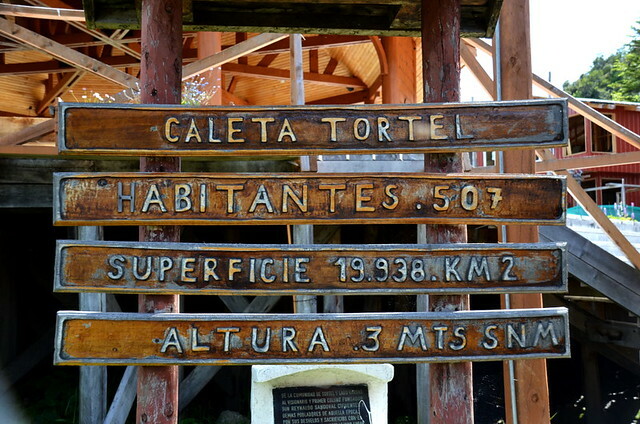 Like everywhere else in Caleta Tortel, everything in Entre Hielos is made of wood. 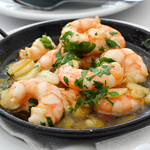 Walls, ceiling, floors, furniture and lighting have all been hewn or woven from cypress trees. 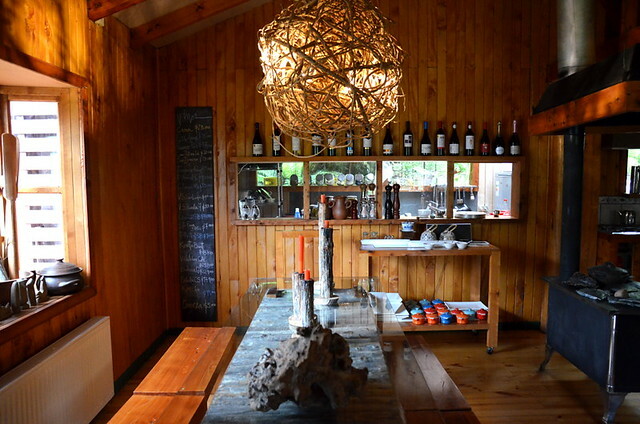 In the open plan lobby/dining room a chunky table sits in front of the stove, its surface heavy with photo-rich tomes about Caleta Tortel and Chilean Patagonia. Around it, chunky armchairs with deep, soft, red cushions sit, and a long window seat which looks down to the water’s edge and the stilted walkways below. To one side of the reception desk is a long, glass-topped, wooden table and benches, and beyond it, visible through letterbox shaped windows, a kitchen conservatory where a chef is busying himself at the stove. We are shown to our room before returning to reception to sign the register. That’s when I realise I’ve left my glasses and iPhone in the pick-up truck. 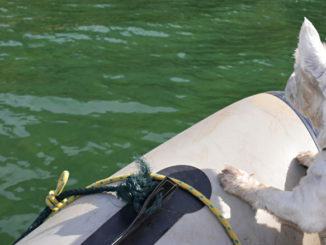 The Chilean Armada built an outpost in Caleta Tortel in 1955 and it became a regular route for the transport of livestock and wood but it wasn’t until 1981 that the village was formally founded. 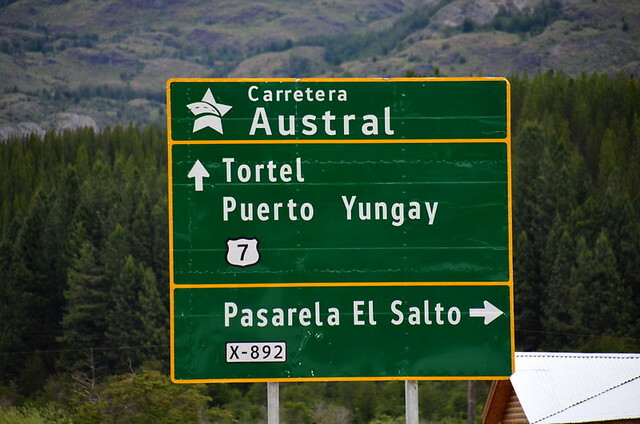 The 23km stretch of road linking the settlement to the Carretera Austral was finally completed in 2003. 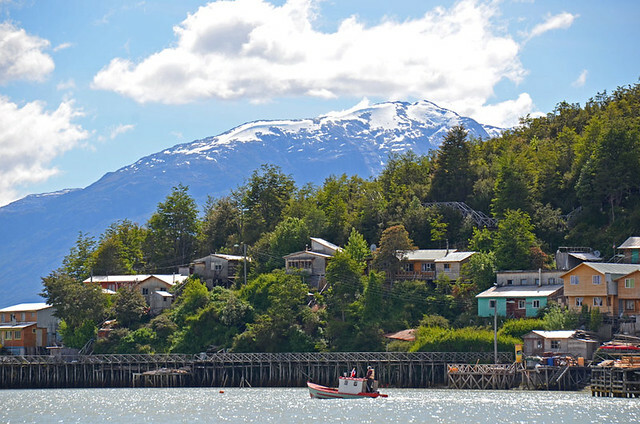 But Tortel’s history didn’t begin with the Navy; its past is shrouded in mystery and the stories that have grown around the little village provide the greatest enigma of the Carretera Austral. In 1905, 200 workers from the island of Chiloé were transported to Caleta Tortel to begin work on opening a shipping route between the Baker River and Chubut in Argentina. Hired by the Explotadora Society Baker, the men were dropped off in a place called Bajo Pisagau, around 6km south of Caleta Tortel, to begin cutting cypress trees and clearing a path; further food and supplies would follow in another ship and the men were to be returned to Chiloé by ship before the winter set in. No ship ever arrived. By the time winter came, most of the workers were dead of a mysterious illness whose symptoms included bruising of the skin, and bleeding. Between 70 and 120 bodies were discovered buried in cypress wood coffins on one of the islands at the mouth of the River Baker. How the men died remains a mystery. Many believe they were poisoned by their employers to avoid paying them, but if that was the case, why did some of the survivors go back to work for the same company the following year? Others believe they died of exhaustion, starvation and scurvy but with an abundance of wildlife in the area, why did they not hunt and fish for fresh food? And if they were all exhausted and starving, who had the strength to make coffins and take the bodies to an island for burial? When a ship finally arrived to rescue them, 12 more men died on the journey home. Today, only 30 graves remain on Isla de Los Muertos, the rest having fallen victim to flooding and erosion. 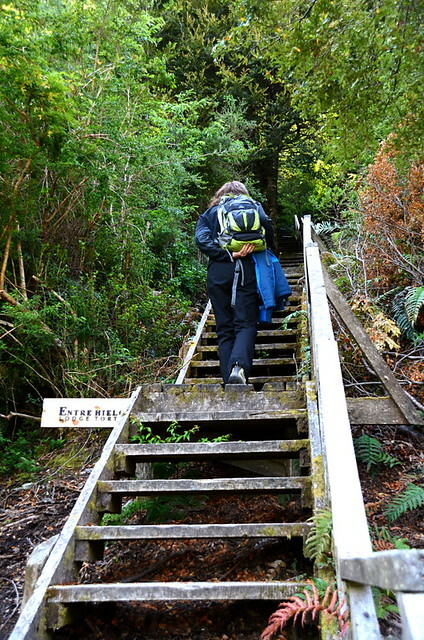 The simple wooden crosses, barely visible within the dense undergrowth, are now the destination for tourist boat excursions and a morbid reminder of the price paid to establish an outpost in this remote and inhospitable region of southern Chile. 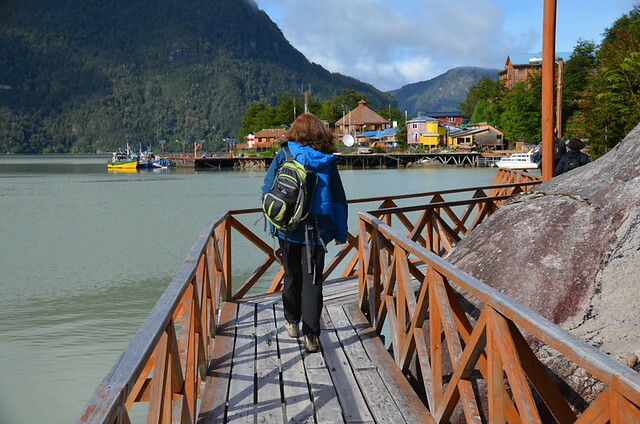 Caleta Tortel had more than just rain sodden walkways and legends of Isla de Los Muertos to share with us, as the next morning would reveal.